Item# VAL703: SQUEAKY BEAR VALENTINE. This fellow wears a heart around his neck, but move his arm and he can go from sweet and flirty to teeth-baring scary in an instant. And he has a working squeaker in his tummy. You should have heard the racket he made when we closed the cover of the scanner! The caption says, "Squeeze me and I'll tell you who my valentine is." He's also a mechanical, so if you move his arm, his eyes move. Self-easel in the back. He's a big one - 8 3/4 inches tall! He's got a faint crease that goes across his eyes, but is in overall very good condition. Unused. Made in Germany circa 1900s. SOLD. Item# VAL704: GIRL WITH POWDER PUFF AND MIRROR VALENTINE. For your friend who is always checking herself in the mirror. This girl seems to be pleased with what she sees. She's holding up a hand mirror, and is smiling at her reflection. The puff in her hand is adorned with a heart and the words, "Valentine Greetings". Move her hand and the puff rises up to her face. The caption says, "I'm just 'Making Up' my mind to be your Valentine." In overall very good condition, with a faint crease in her hair - only visible when the light is at the right angle. Inscription on back. Made in USA. 1928. $12.00. Item# VAL315: SENTIMENTAL EMBOSSED VALENTINE. A sweet and simple basket of flowers, tied with a blue ribbon and the message, "To One I Love". At the bottom, a heart that folds forward. 5 1/4 inches high. One crease on right side; otherwise in excellent condition. Inscription on back. Printed in Germany circa 1890. $8.00. Item# VAL65: GIRL WITH DOG HONEYCOMB VALENTINE. This one features a little girl walking her terrier in the snow. The dog is wearing a doggie coat, and the girl is wearing a bright red hat and a plaid rain cape. Open the cape to reveal the HONEYCOMB. The base says, "Just as sure as winter, Just as sure as snow, I'll always be your sweetheart, And you'll always be my beau!" 8 1/4 inches high, Made in Canada. Slight bends near the top; otherwise in excellent condition. Signed in ink on the back. Dated 1944. SOLD. Item# VAL314: LARGE LACY WHITNEY VALENTINE. A really big and lacy valentine. In the background, a little girl dines with her teddy bear. The lace overlay features a boy and girl in a canoe, and a winged cupid in a heart. The beautiful Whitney poem inside includes a boy and girl hugging in a boat with two hear pendulum clocks. Signature inside. Two creased corners - back only. Front and inside are excellent. 6 1/4 inches square. Made in USa circa 1920. SOLD. Item# VAL712: FAVORITE BROTHER VALENTINE. Looking for a card for your dear brother? This is it! A boy in overalls sits in a wheelbarrow with his puppies. Card says, "Hi Brother! Here's a valentine." Inside, the poem reads, "On Valentine's Day, I'm going to shout it - 'You're one swell Brother, No doubt about it!'" This card is by Norcross, a company that went out of business in the early 1980s. It is in pristine condition and unused. Perfect for your brother! 5 1/4 inches high, Made in USA, circa 1950. SOLD. Item# VAL225: EMBOSSED THREE-PART RIBBON VALENTINE. This is a sweet three-parter, all embossed, all suspended from a thin, pale green ribbon. The top is a child with purple flowers, and is inscribed, "To One I Love". The second part is an open book with more flowers, inscribed, "A Token of True Regard". The bottom is a tiny heart with a golden bow. It says, "Forget Me Not." The whole thing is 9 inches long when hung. The ribbon is frayed, but still hanging in there. Overall in excellent condition. Printed in Germany, circa 1890. $28.00. Item# VAL710: TEACHER'S VALENTINE.Remember the days when every child brought a valentine for the teacher? Nowadays, our harried teachers could use a nice gesture like a valentine. This one features a kitten holding a rose in its mouth The front says, "For a Very Nice Teacher, A Valentine." The inside says, "You're one of the nicest teachers I know, And this Valentine comes to tell you so!" 5 inches high, made by Norcross, a company out of business since the early 80s. In pristine condition, unused, it even comes with the original envelope. Made in USA circa 1950. $5.00. Item# VAL308: DARLING LITTLE GIRL PULL DOWN VALENTINE. This valentine scores a "10" on the cute scale. A wide-eyed blonde girl in blue dress and pinafore holds a heart in her hand.In the background are a heart-adorned harp, sheet music, and a dove carrying a heart-adorned envelope. The base says, "To My Valentine". When pulled down, the poem on the inside of the base reads, "To My Valentine. My heart is red, your eyes are blue. My love for you is sweet and true." 4 1/2 inches high. Some foxing and wear at the fold. Inscribed on back. German, circa 1890. $15.00. Item# VAL236: RAPHAEL TUCK BEAUTIFULLY LITHOGRAPHED VALENTINE. Girl with a pink ribbon in her hair holds a floral-printed hatbox containing a little cupid holding a heart. The poem says, "Go, little Cupid, to My Valentine, Say that I love her, And want her to be mine." So this little girl has received quite a Valentine's Day gift! If you consider a small live creature in a hatbox to be a great gift. This is a fine example of the quality of cards by Raphael Tuck & Sons, the premier manufacturer of cards in the late-19th and early-20th century. Self easel, which came off and has been professionally re-attached with archival materials. Otherwise excellent condition. Printed in Germany circa 1890. $45.00. Item# VAL321: FABULOUS DOUBLE PULLDOWN LAYERED VALENTINE. 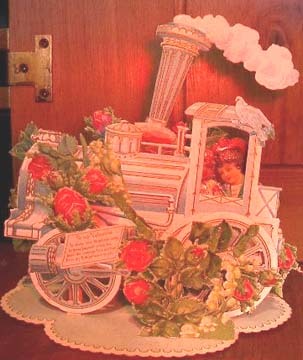 A locomotive layered with roses and lilies of the valley, with a smokestack and pink honeycomb. A beautiful boy in a sailor suit and a girl clutching a bunch of violets peek through the window of the locomotive, while a dove perches on the roof. A poem in the front says, "To my Valentine, In these blue forget-me-nots, In these fragrant roses too, Read the message fond and true, From my faithful heart to you." 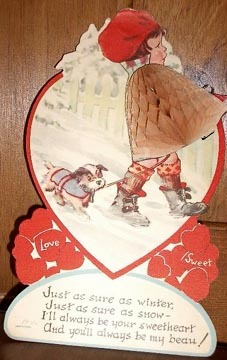 This valentine folds down in two directions - front and back to make a very stable standing display. 6 1/2 inches high. Very good condition. Professionally restored. Inscribed on back and dated 1909. Made in Germany. $150.00. Item# VAL319: GIRL IN A ROWBOAT EMBOSSED STAND-UP VALENTINE. This cute reheaded girl ina rowboat named Uandi says, "had to 'put my oar in' my valentine". Fold down the front and INTERIOR VIEW there she is in a blue bathing suit, holding a heart that says, "I've been going around in circles ever since I first saw you." Pull the girl slightly forward to form the stand-up. 3 3/4 inches across. In excellent condition. Pencil inscribed on back. Made in Germany circa 1920. SOLD. 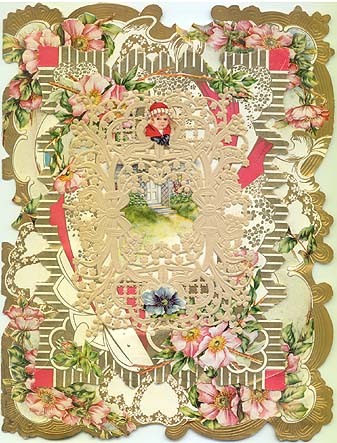 Item# VAL221: VERY OLD, VERY LARGE EMBOSSED LACY LAYERED VALENTINE. This one has everything: It's very large, has a pink and blue frame, paper lace, blue flowers, a man and a woman with a fan, a tiny card that says, "Trust to me", and a lady in a bonnet. INside, the poem reads, "Fondly I'm dreaming, Thou thinkest of me, Truth, and not seeming My motto shall be, Love ever beaming From myheart to thee." 6 1/2 inches by 10 inches. In very good condition. Unused. Printed in Germany circa 1880. SOLD. Item# VAL222: EMBOSSED "GUESS WHO?" WHITNEY VALENTINE. Wonderful embossed silver spider webs, paper lace with swans and reeds, a cupid driving a car and a little girl in a wide-brimmed hat with her hands over the eyes of a little boy, on a brilliant orange, gold and green background. The front says, "To My Valentine". The illustrated poem inside reads, "Valentines have always been Such nice things to send When you want to tell your thoughts To some special friend. You're the friend - that I confess. Now the thoughts I'll let you guess." Very intriguing! This is a very large top-opening card, measuring 8 inches square. Its condition is very good; there's some wear on some of the spider webs, a small amount of paper missing from the back (no holes) but the rest of it is beautiful, as one would expect from a Whitney card. Made in USA, circa 1890. SOLD. Item# VAL57: MECHANICAL TELEVISION AS IT WAS IN THE 1940S VALENTINE. A young girl fiddles with the knobs on a very early television set. Caption reads, "Since television came my way I see my Valentine each day". Her love is pictured on the heart-shaped screen. Move the heart-shaped lever and he's replaced with the words, "My Valentine". 5 3/4 inches high, Made in USA, in excellent condition, self easel. Signed in pencil on the back, and dated 1944. SOLD . Item# VAL903: MECHANICAL RUNNING BOY IN FORMAL EVENING ATTIRE VALENTINE. This young man in cape, tophat, white tie and spats, even sports a pocket watch! He carries a heart that says, "Valentine Greetings". His feet are on a wheel, so you can make him "run" across a table top. Unused. Slight wear on tips of cape, but overall in very good+ condition. Approximately 4 inches high. German, C. 1900. SOLD. Item# VAL224: LACY HAND-COLORED VALENTINE. The paper lace overlay on this one has hearts and flowers, and says, "To My Love". Underneath that there's a boy and girl in winter attire and a border that has been lovingly hand-colored in crayon by a child. It's colored in red, yellow, and blue, and is quite lovely. 4 1/2 inches square. In very good condition. Faint pencil inscription on back. Made in USA circa 1900. $8.00. Item# VAL708: GREAT CHARACTER VALENTINE. This valentine features Butch, a character produced by Norcross cards, out of business since the early 80s. It features Butch on the front, in a turban with a crystal ball surrounded by valentines and question marks. It says, "Just ask the little crystal ball, It'll tell who loves you best of all-. Inside, it says, "YER MUDDER!" over a picture of Butch barely tolerating a kiss from his Mom. This is a great one to send your son! 5 inches high, unused, tiny amount of paper loss on the back, barely visible. Made in USA circa 1940s. $6.00. Item# VAL432: MECHANICAL LUMBERJACK VALENTINE. If your loved one loves his chainsaw, this is the valentine for him(or her)! Little boy saws a log embedded with a heart. A duck holds a sign that says, "I'm just a chip off the old block." Move the heart behind the boy's arm and he saws the log. 8 inches high. Inscribed on back. Very good condition, with a crease on his hat, and a small crease down at the bottom. Made in USA, C. 1939. SOLD. Item# VAL435: WHITNEY BOY AT SUNDIAL VALENTINE. Valentine by Whitney features a young boy and his puppy at a sundial. Inside, a boy and girl meet at the garden fence. The poem reads, "Upon this little Valentine, Your name I have inscribed with care, If you could look within my heart, You'd find the same name written there." Pencil inscription on back. Approximately 6 inches high. Excellent condition. American, C. 1910. SOLD. Item# VAL58: GREAT MECHANICAL BEAR WITH FLAPJACKS VALENTINE. This bear in blue checkered apron is making heart-shaped flapjacks. The caption reads, "I like flapjacks but I like you batter". Groan. Spin the wheel and the flapjacks jump out of the pan and into the plate. Of course, you can always spin the wheel the other way and make the flapjacks go back onto the griddle, if you like. 5 3/4 inches high. Made in USA. Signed in ink on the back and dated 1942.. In excellent condition. $8.00. Item# VAL711: DIZZY BEAR VALENTINE. A bear who is obviously in love smells a daisy as it spins in circles. Front says, "Oh Valentine! I'm dizzy and dopey and daft as a daisy, 'Cause darn it, dag-nabit," ... the inside says, "I love ya like crazy!" 5 inches high, pristine, never used, made by Norcross, a company out of business since the early 80s. Made in USA< circa 1950. $4.00. Item# VAL451: ENORMOUS LAYERED VALENTINE. This one makes a statement! It has layers of lace and flowers, gold and embossing. Inside is a beautiful line drawing of cupids, butterflies and flowers, and a sweet poem. A whopping 8 inches by 10 inches. Overall excellent condition, with one corner crease to top layer in front, and one corner crease in back cover. Unused. American, C.1900. SOLD. Item# VAL59: MECHANICAL FISHERMAN VALENTINE. This great little fisherman, says, "This aint no fish story", and "Can't help braggin', Because it's true, I'd be a perfect catch for you - be mine!" This one's great if you know someone who fishes. Move the lever and you can make his little fish grow bigger and bigger! 8 1/4 inches high, self easel, Made in USA, Signed on back and dated 1945. One faint crease near the top; otherwise in overall excellent condition. SOLD. Item#VAL199: UNIQUE CLOWN VALENTINE. This valentine doubles as a toy. Pull on the stick and he becomes a jumping jack. Not only that, his head flips up too! 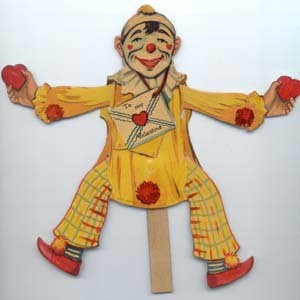 This valentine has been professionally restored and is in excellent condition with one crease across the clown's face. $125.00.